Looks like mashed potatoes, doesn't it? We've been following the Paleo diet for a few months now, and are really seeing tremendous improvement in our allergic symptoms. Previously, we had been avoiding a wide range of the foods that our RAST allergy bloodwork indicated were a problem, but we were all still suffering from strange rashes, rosacea, flaky ear canals, sinus congestion and drip, achy muscles, swollen glands, bad breath, acne, depression, and a host of other (less polite) digestive problems. The Paleo plan, for those of you who are not yet converts, eliminates all grains, dairy, legumes, potatoes, sugar, and processed foods. An additional layer of elimination is available on the Autoimmune Protocol, where nuts, seeds, eggs, nightshade vegetables, and a few other items are also avoided. While it seems strange that these seemingly "healthy" foods could be the culprits behind our unpleasant health problems, the proof is in the dramatic improvement in the way we feel. We're sleeping better, have eliminated chronic headaches and stomachaches, and the females in our group (ok, me) are much less moody. Yes, I admit, I was a real pain sometimes. Every symptom from the first paragraph has resolved, and we're all losing weight as well. Switching over to the Paleo diet is a difficult transition, especially because so many foods need to be cooked from scratch. Sandwiches are no longer an option for school lunches. You can't pour a quick bowl of cereal and be out the door in the morning. It's a commitment. Luckily, in our case, we were already used to creating alternative versions of popular foods, so we were halfway there. This is a roundabout way of getting to the point of my post - mashed turnips make a great substitute for mashed potatoes. Our transition is made easier when we can replace favorite foods with Paleo options that look or taste very similar. What is pot roast without mashed potatoes? This version of mashed turnips is the perfect solution. 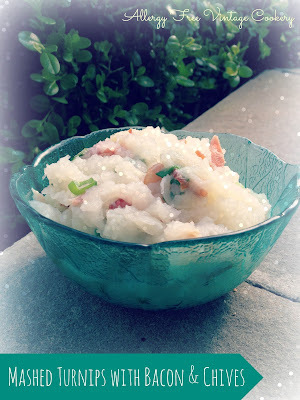 Made with coconut milk, coconut butter, bacon and chives, it combines the texture of a mashed potato with a bold flavor that complements the meat very well. The trickiest part of this recipe is draining the excess liquid before you mash. Even if you aren't avoiding potatoes, try this turnip recipe -- it's really good! Peel and cut the turnips into a large dice. Boil for about 20 minutes, or until the turnips are soft. While the turnips are boiling, cook the bacon your favorite way. I like to spread the pieces on a baking sheet and bake in the oven for 10 - 15 minutes at 350 degrees. Drain the bacon on paper towels. Drain the water from the turnips, then return them to the pot over low heat to remove a bit more liquid. Add the coconut milk, coconut butter, and salt, and mash with a potato masher. Stir in the bacon and chives and serve warm. Shared with Mostly Homemade Monday, Slightly Indulgent Tuesday, Hearth and Soul Hop, Tuesday's Table, Fat Tuesday, Allergy Free Wednesday, Real Food Wednesday, Gluten Free Wednesday, Pennywise Platter, Allergy Friendly Friday, Anything Goes, Gluten Free Friday, Allergy Free Alaska, and Traditional Tuesday. I'm so happy for you that you're having such success with the paleo diet. It's true that it can be a challenging transition, but the results do make it worthwhile. I don't follow the Paleo diet but this recipe sounds absolutely delicious! I always enjoy turnips and the bacon and chives would add fantastic flavour. Thank you for sharing this recipe with the Hearth and Soul hop.